What is the most exciting thing about Joget Workflow v5? Joget Workflow v5 comes with many new features and enhancements You can view the full list of new features from the v5 knowledge base located here. So what is the most exciting v5 feature? For me it has to be the much enhanced App Generator. Imagine, generate a production ready Joget Workflow app in minutes. It has opened up new possibilities for developers (citizen or otherwise) and business users to greatly speed up their Enterprise app development process. Not just for prototyping but for delivering full functioning production applications. Well, exactly how is the latest App Generator exciting compared to v4 or to other agile development platform. Here is what I put forward. First of all, the App Generator made it's first appearance in Joget Workflow v4 beta back in 2013. It was ground breaking in that it allowed users to create a form and from the form, generate a full-fledged functioning web app with or without a workflow approval cycle. And all this without a single line of code written. With the App Generator, Joget Workflow brings a new dimension to “low code” platform. It is more than a source code generator and that although an agile platform maybe conventional, the app generator allows the users to extend their agile methodology to experiment and continuously test their application with their end-users. Developers and business users are now able to very rapidly and easily create working prototypes without any coding. This has allowed the developers to focus on the business layer and iteratively work with their end-users to gather requirements and achieve their final application objectives. So what is the big deal in v5’s App Generator? In v5, Joget Workflow will spot a much enhanced App Generator that gives the users more options to configure the data listings and CRUD lists for the UI (Userviews). But the most interesting feature of the new app generator is the ability to choose a process template or templates to use in the generated app. Compared to the previous v4 app generator, these process templates are much more configurable and customizable. The user is now able to choose between two process templates (Approval Process or Assignment Process) or include both as part of their app. User can also customize the notification messages that are sent out during the process flow. All the labels in the app can be re-labeled and customized allowing the users to internationalize their apps instantly. Under the hood, the app generator has been completely rebuilt. 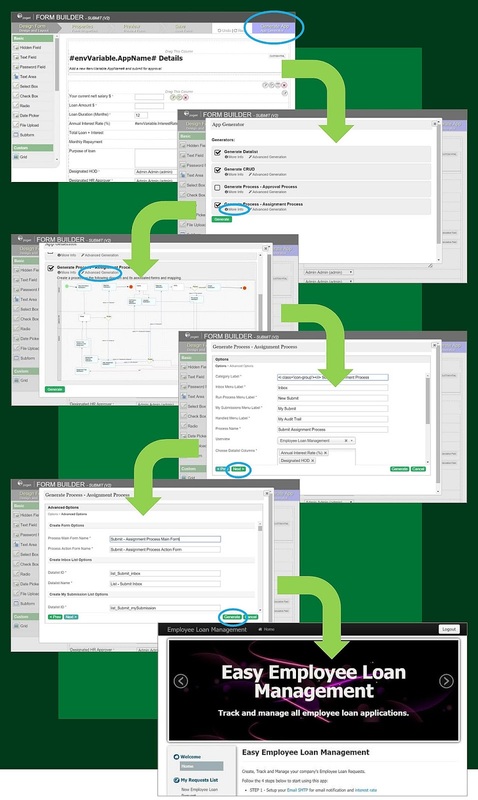 It now has an app templating system that utilizes the Joget Workflow plug-in architecture, which allows developers and system integrators to extend the app generator functions to create and add their own new data lists, userviews and process templates. The collection of these app generator templates will allow them to re-use and apply their domain expertise to their client’s needs. For example, a system integrator with accumulated experience and domain knowledge in finance may build app generator templates that caters to the finance industry; when used in varying combinations will generate app prototypes quickly to suit a particular market or business need. So, if you are a programmer, solution provider or a system integrator, and you want to extend the app generator to cater to your multiple needs, you should check out the Joget Workflow Generator Plugins. Watch the following "Joget Workflow v5 Introduction Tutorial" video to see the new App Generator in action. With the App Generator and the Joget Workflow platform, the possibility now exist where end-users do not need to completely depend on the developers and programmers to develop what they need for their enterprise apps. They can now very quickly build prototypes or minimal viable products to meet their own immediate needs and through a process of continuous improvement, their software will continuously evolve and improve; just as we will continue to evolve and improve Joget Workflow from a code-less to a codeless platform.